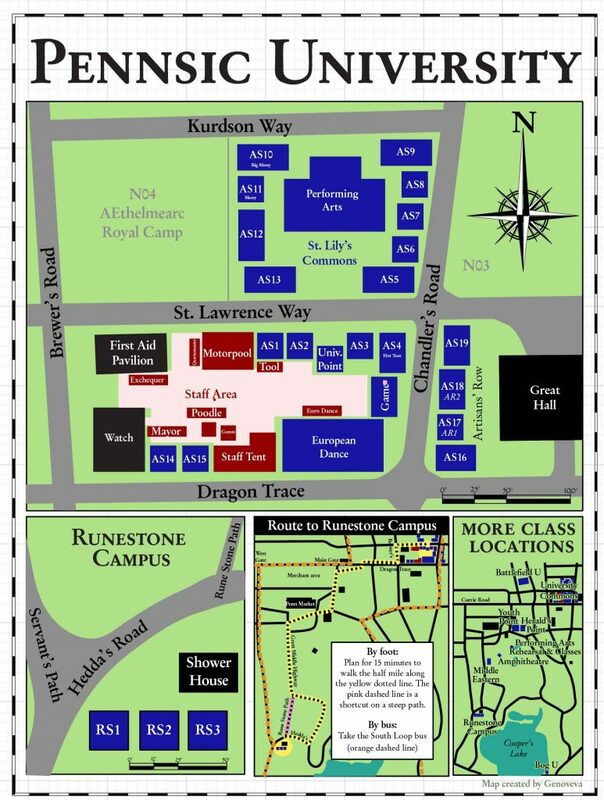 This year, Pennsic has a new set of classrooms called Runestone Campus. To help students find this new location, I’ve created a new map of Pennsic University that shows University Commons (the main campus), Runestone Campus, and several other popular class locations through the site. I’ve also mapped out the distance to walk from the University Commons to Runestone Campus, as I thought this would be helpful to know so folks can get to classes in time. Everything should be to scale, as the map was based off aerial photography and actual tent sizes. Copies of this map will be available at University Point, but I’m also including a PDF here for anyone who might like to look at it in advance. Hope this helps someone! Many thanks to the Deputy Mayor of Technical Services (THL Magnus), the Pennsic Chancellor (Captain Elias Gedney), and the Deputy Mayor of Zoning and Planning a.k.a. Land One (Duchess Elizabeth).